With their franchise player ending his season with a torn ACL, the Knicks are now sharing their minutes with the entire bench. 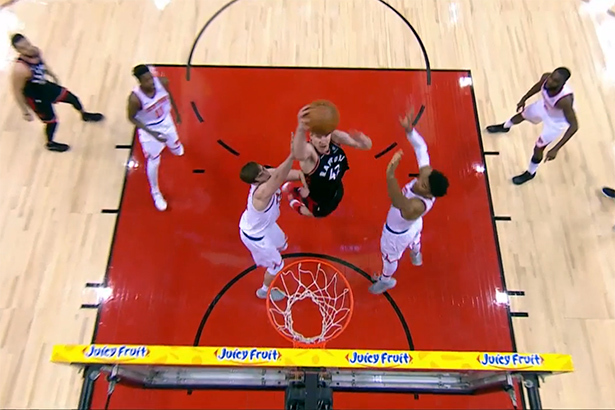 Luke Kornet had only played 4 minutes, in a preseason game until last night, but in Toronto he spent 22 minutes on the floor. Kornet debuted strong, finishing in double-double, with 11 points and 10 rebounds, also delivering 4 blocks. The Raptors, led by Jonas Valanciunas with 18 points an 10 rebounds, had no problem to deal with New York and won 113-89, in a game that they controlled from one end to the other. The Knicks managed a 7-0 run in the closing minute, avoiding thus, an even more embarrassing loss. Michael Beasley scored 21 points as a starter and Trey Burke added 12 buckets off the bench. Jarrett Jack finished with 10 while the rest of the team ended in single figures.